- Publisher As long as small groups are made of people, there are bound to be problems! The Small Group Fitness Kit helps group leaders turn those problems into opportunities for growth. You'll find help for dealing with topics such as: *how to handle dominant personalities *how to keep group members from losing interest *how to resolve conflicts *which risks are worth taking *leadership issues that affect the whole group *what leaders can do when they get in over their heads *and much more! - Publisher Turn problems into opportunities for growth. About "Fitness Kit - How to Keep Your Group Healthy & Growing"
As long as small groups are made of people, there are bound to be problems! 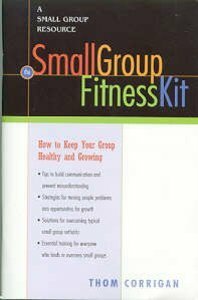 The Small Group Fitness Kit helps group leaders turn those problems into opportunities for growth. You'll find help for dealing with topics such as: *how to handle dominant personalities *how to keep group members from losing interest *how to resolve conflicts *which risks are worth taking *leadership issues that affect the whole group *what leaders can do when they get in over their heads *and much more! Turn problems into opportunities for growth.